Facing History and Ourselves has partnered with the Hearts on Fire Movement to offer teachers tools to fire up their students and inspire them to become future leaders for social justice and change. 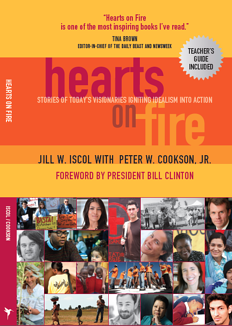 The movement was launched after the release of Hearts on Fire: Stories of Today’s Visionaries Igniting Idealism into Action, which showcases individual stories of people (Visionaries) working for positive change in the world. Hearts on Fire believes that the path to optimism is participation. If students don’t like what they see, if they are concerned about the future of this country and their place in it, they must take the bold step of getting involved and working for change. To do so, they need the guidance and encouragement of the adults in their lives, especially their teachers. That's why we created the The Hearts on Fire Teacher’s Guide: Creating Global Citizens, written by Daniel Braunfeld of Facing History and Ourselves and Jill Iscol of the IF Hummingbird Foundation. It's designed to engage the minds and hearts of students ages 10-24 through the powerful examples of the Visionaries that are highlighted in Hearts on Fire. It challenges students to think critically about how they can make a difference. By seeing real life stories of positive change, students can be empowered to be active citizens who choose to participate in bettering their own communities. It's important to balance students' questions and concerns about the violence that's happening around the world with a sense of hope and the feeling that they have the ability to change the world for the better - in small or big ways. The Hearts on Fire teaching guide may also be an important reminder for adults. We are processing the violence, the divisiveness, and the uncertainty alongside young people, with the added responsibility of helping them to make sense of it all. This guide can provide inspiration for educators and students to bring everyone to a better place and create a more positive view of the year ahead. Teachers can even bring Visionaries into their classroom using Skype in the Classroom, which connects social change makers with students from around the globe. Last Spring, four Facing History teachers and four classrooms at IS289 in New York City participated in this pilot program organized by Karen Scher from Facing History and led by 8th grade teacher Patrick Hector. The unit was centered around “Upstanders: Past and Present” and featured Visionary Jimmie Briggs, who founded the non-profit ManUp to fight violence against girls and women. The lesson was a hit with both Hector and his students. In an increasingly interconnected world, educators play a key role in broadening a student’s horizons from his or her own backyard to the world community. Both Hearts on Fire and Facing History and Ourselves believe that the world will be a better place when lessons about choosing to participate and empathy are at the heart of classroom learning.